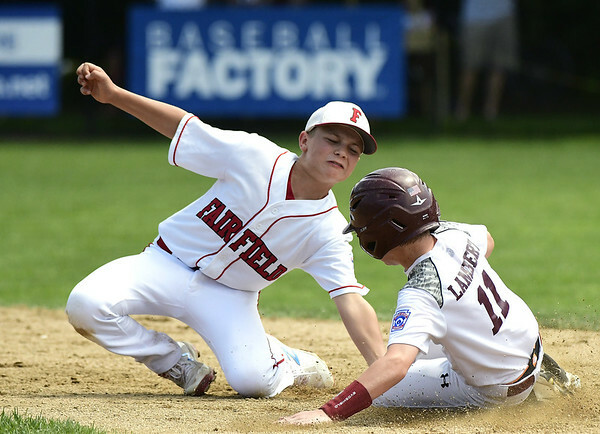 BRISTOL - After reaching the U.S. semifinal at the Little League World Series in Williamsport last year, a return trip this summer for the Fairfield American (CT) all-star team wasn’t to be. New Hampshire eliminated Connecticut 9-3 from the New England Regional Thursday afternoon at Breen Field. New Hampshire got off to a fast start, putting up three runs in the bottom of the first inning highlighted by a solo home run from leadoff hitter Ryan Strand, who finished the game 4-for-4 with a pair of RBI and runs scored. Four of the next hitters behind Strand also recorded hits. Logan Simmons, Braeden Lambert and Cam Hujsak each had hits. Max Ouellette added a pair of hits with 2 RBI. Simmons start on the mound, paired with Strand’s solo shot, helped get the momentum in New Hampshire’s favor right away. In the first and second innings Simmons struck out the side. Connecticut’s offense finally got going in the third inning with a pair of runs driven in on a double by Robbie Donahue, pulling Connecticut within one run at the time. Over the next two innings, New Hampshire outscored Connecticut 5-1 and the offensive firepower was the difference for New Hampshire. Charlie Yates and Pierce Cowles both struggled on the mound for Connecticut. Yates started the game and lasted just 1/3 of an inning. He gave up a pair of hits, walked one and allowed three earned runs before giving way to Cowles. He allowed five earned runs, seven hits, struck out eight and walked one batter. Cowles, Yates, Donahue, Timmy Domizio, Aidan Gouley, Liam Grady, Dustin Walters and Eli Balkan all had hits in the game for Connecticut. With its win, New Hampshire will face Rhode Island today at 1 p.m. with the winner moving on to the championship game on Saturday at 1 p.m. against Massachusetts. New Hampshire has a few options for pitchers today. Posted in Newington Town Crier, General Sports on Thursday, 9 August 2018 20:42. Updated: Thursday, 9 August 2018 20:45.